There are quite a few zoo careers out there - many are obvious, but some may not be. Who wouldn't want a zoo career? It's more difficult to acquire a job in the zoo than you might imagine, however. Since so many people love animals and want to work with them full-time, the field is competitive. Education and experience are musts. Depending on the field you would like to enter, you may need to study biology, math, horticulture, zoology, or behavioral science in order to get the job of your dreams. Study hard and get experience from a veterinarian's office, Humane Society, or farm, for example, before applying at a zoo. You could start out working in a gift shop or selling food at the zoo to get your foot in the door, but experience and a college degree are really the most valuable assets you can offer when you someday want to care for the animals. 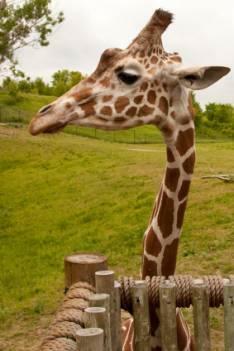 Animal health care and zookeeping encompass almost everything that keeps animals safe and secure. Those who choose zoo careers within the animal health care and zookeeping fields may feed the animals, make sure they seem to be feeling well, clean their living areas, and collect samples for the lab. Those in animal health care also do a bit of observation, record keeping, and training.Managers and curators in this category have the authority to choose which animals will be coming to the zoo, which ones to send away, which ones to breed, and also work on exhibit designs, and written care policies for the animals. In addition, they manage staff and help take care of the animals. Zookeepers also work with other experts in the field to help preserve habitats and protect endangered species, then they educate the public about what needs to be done to save those habitats and animals. Some prefer to keep a mainly general knowledge about many different types of animals while others choose to specialize in a certain species. In the midst of all the exotic animals, the plants often go unnoticed. However, someone has to know how to take care of them and keep them looking healthy. Those who work with plants in the zoo should know which plants are good for aesthetics, shade, food for the animals, or any combination. Those with careers in horticulture at the zoo have to make sure the irrigation systems are getting water to the plants; trim trees, plant bushes, flowers, and trees; and even pull weeds. If you're interested in management and plants, don't forget about supervisory opportunities. In this position, you will not only be in charge of your team, but you'll need to work with other experts in the field to best plan the layout of the zoo's plants and learn how to keep them healthy. Once a zoo seems to have a rhythm and balance that makes it work, that's great, but the research doesn't end there. Someone has to observe the animals, record their findings, compile data with other experts, and analyze the information they have. In the lab, those who make their zoo career in the education and research department may find themselves analyzing blood or other samples from the animals that seem to be feeling poorly, for example. They may investigate DNA samples. There are many possibilities within this field alone, and it's one way to enjoy the zoo atmosphere without being outdoors constantly. You can work in a zoo and not work with the animals. You can help the visitors or employees, prepare food, work in a gift shop, or even work on the events staff. At the entrance of the zoo, there are people who are there to answer questions, scan tickets, sell tickets, and more. Some zoos even have guided tours, so knowledgeable tour guides are a must. In other cases, speakers for special exhibits are needed. There are more zoo careers than may initially meet the eye. However, to be considered for most of them, you will need a college degree in a corresponding field and some experience working with animals before you apply. Zoo careers are incredibly rewarding if you love animals and want them to recognize you as a caretaker-or if you enjoy science and want to study and help animals. However, they do take a lot of planning, patience, and persistence to acquire. In any zoo career, it's important to be compassionate and a good observer. No matter what your interaction with the animals is like, you'll want to be familiar with their personalities and behaviors.